The Episcopal Church has a unique place in the spectrum of Christian experience. Our worship is rooted in Scripture, with vibrant expression of prayer, music, sacrament, and word. Episcopalians have long stood for service to the wider community, and we express our faith in outreach and social concern we try to walk the talk of Jesus’ teachings. We are known for asking good questions rather than providing simple answers for complex issues. And we are known for our inclusiveness; we recognize that Christ’s banquet is large enough to include every person. We believe in a God who loves us, the Creator, Redeemer, and Sustainer who created the universe, who in Jesus Christ has healed the human condition of fear, estrangement, and death, and who sustains each of us through love and grace. Experience: we believe we are called to reflect upon the experience of everyday life as an ongoing journey of faith. If this description of our theology is interesting, please join us on Sundays at 10:30 a.m., it will be great to see you! 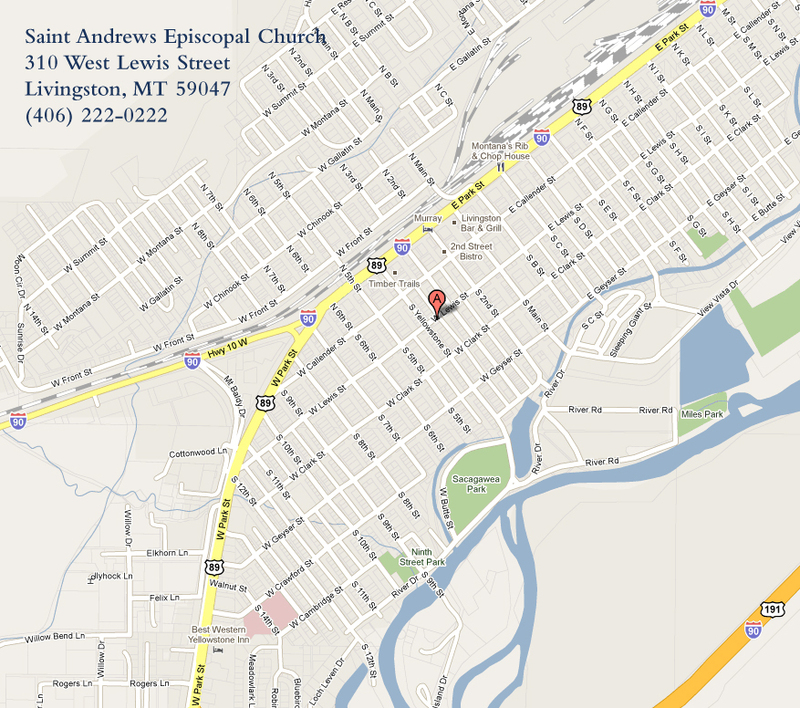 We are located at 310 West Lewis Street in Livingston, on the corner of 3rd and Lewis.